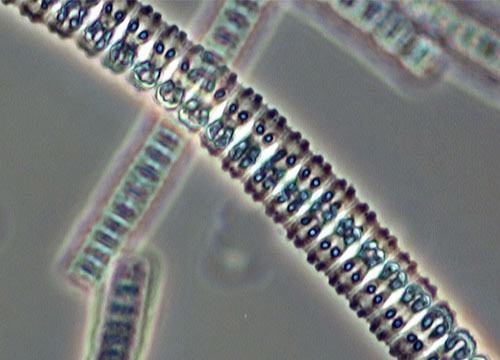 A common sight floating atop stagnant water, algae of the genus Zygnema can be identified microscopically by its two star-shaped chloroplasts per cell. Found often alongside Spirogyra, another still water green algal genus, Zygnema filaments combine to form green or yellow-brown mats and can reproduce sexually or asexually, including vegetatively. When their environment becomes unsuitable, akinetes, which are spore-like bodies, are produced asexually. Their very thick cell walls allow these algae to withstand droughts and harsh winters. Sexual reproduction may also commence in poor environments as two side-by-side filaments grow conjugation tubes toward each other. DNA from each plant moves toward the center of the tube, combines, and forms a zygospore. The zygospore sinks into the sediments of the still waters, awaiting more favorable habitat conditions before emerging as new algal strands. However, when nitrates and phosphates are available in sufficient quantities, most frequently vegetative reproduction, or fragmentation of Zygnema, occurs. 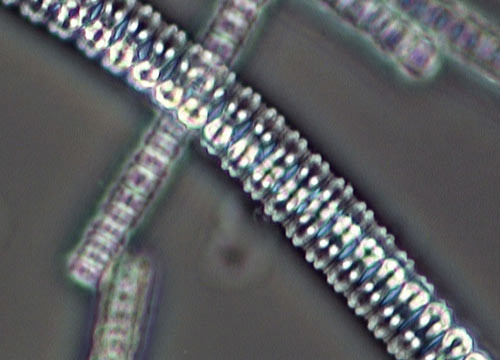 As with Spirogyra, thick mats and green clouds of Zygnema can indicate over-fertilization or "enrichment" of water bodies, often by contaminated storm water runoff. During the day, the hair-like strands of green algae produce relatively large volumes of dissolved oxygen. At night, the metabolic processes reverse and the masses of green algae consume oxygen and produce carbon dioxide gas as a cellular respiratory waste product. The rapid creation of carbon dioxide in the water can change the pH level too quickly for aquatic organisms, such as fish, resulting in stress, and abnormal behaviors that make them much more susceptible to predators. During winter months in temperate regions the algal mats die and decompose, creating a significant biological oxygen demand due to bacteria feeding on the decaying organic plant matter. Severe competition for limited oxygen resources often results in a phenomenon referred to as winterkill, a large die-off of fish populations that remains generally undiscovered until the following spring.